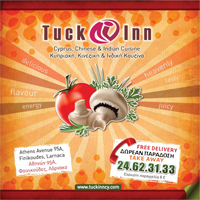 Tuck Inn was established in 1986 and has since served the most delicious Cypriot dishes. We now also offer both Cinese and Indian dishes to compliment our already extensive menu. Tuck Inn is a restaurant that has been set up to serve freshly prepared food and beverages to order, to be consumed on and off the premises. Our loyal and regular returning customers are the rewards of our hard work and efforts in keeping up such a high standard of customer care and cuisine.